PHUKET: The management of the popular Nikki Beach Phuket have yet to reveal the reasons behind the sudden closure of the local outlet of the international beach club franchise at Bangtao, on Phuket’s west coast. 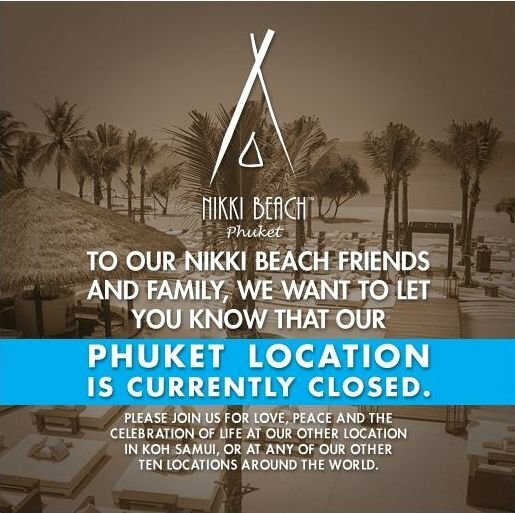 The club posted a notice on its Facebook page on Saturday (Sept 5), stating: “To our Nikki Beach Friends and Family, we want to let you know that our Phuket location is currently closed. In addition to the Phuket and Koh Samui venues, Nikki Beach operates clubs at Miami Beach, USA; St Tropez, France; Saint Barthélemy, French West Indies; Marbella, Mallorca and Ibiza, Spain; Cabo San Lucas, Mexico; Marrakech, Morocco; Porto Heli, Greece ; and Bali, Indonesia. The Phuket club’s Facebook page remains to be updated. Meanwhile, the sudden closure has taken its toll on regular guests. One reveller told The Phuket News, “It’s a big disappointment that Nikki Beach Phuket has closed, I spent a lot of time there. So many comments on their FB page saying how pleased we all were to hear of the closure. Very few comments in support. It is a noisy, unwanted  obscene establishment on a quiet beach. Not surprisingly all negative comments on FB have been deleted, leaving only a few people in support. Totally distorts the say of majority who loathe this place. hi,as I am running at least 3 times a week on the bang tao beach to layan beach I pass also the now closed nikki club. Unfortunately there are rumours that the venue will reopen shortly under Russian management. Now might be the opportunity to petition against another noise nuisance? Now the rest of us can enjoy the beach there within 300m of the place without having to put up with the dreadful obscenely loud music. Anyone checked for official notices affixed outside or inside? Hopefully the monstrosity will be demolished and restore my faith in an even handed approach to illegal development by the Thai authorities.